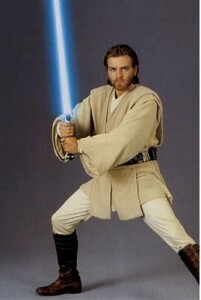 Obi-Wan Kenobi was born in 57 BBY, the first son of a moderately wealthy family, and was taken to Coruscant to begin his Jedi training shortly thereafter. His homeworld was Stewjon, from which Kenobi had vague, pleasant memories of playing with his brother, Owen, in a green, grassy area. It is recorded that Kenobi might have occasionally visited Owen and the rest of the Kenobi family later in his life.